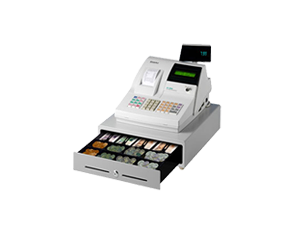 Cash Tills Direct is the first choice for thousands of customers looking to buy cash registers, tills, till rolls, ink ribbons, cash register keys and drawer inserts. Our range of Sharp, Casio and Sam4s cash registers and shop tills are probably the best prices that you will find on the internet – if you can find them cheaper then we will endeavour to match the price. As well as offering excellent prices, we also pride ourselves on the quality of our service. Some models include on-site service as standard. In addition we offer cash registers for short term hire. The Casio SES-3000 Cash Register is now on offer. Features include Receipt / Journal roll, 30 categories, X/Z readings etc. Established in 1972, we are a family run business with thousands of customers across the UK, including government departments, pubs, clubs, restaurants, cafes, shops and many more varied types of businesses. We constantly monitor the internet to ensure that we can offer you the best online cash registers and cash register till deals. We have a massive range of Sharp cash registers in stock, ready for next day delivery. If you’re looking for a Sam4s cash register you will find the best internet prices here. Our Casio Cash register range start from under £100 and offer excellent value for money.